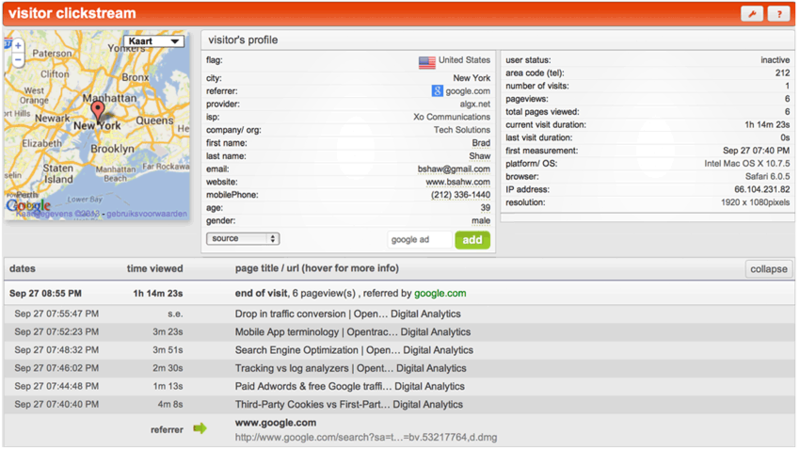 Enter details directly into Visitor Profiles, for example: name, company, email or contact info. Identify users and tag them so you can follow or look them up through time. Invaluable for email campaigns or tracking hot prospects or leads. We offer both manual tagging AND automated push of information. Do your visitors sign-up, receive emails and newsletters, login, fill in Forms, or download PDFs? All of this information contributes to visitors profiles, and can easily be sent to our system. It can also be exported, and integrated with other products, like pipedrive, salesforce, or just spreadsheet exports. Manual: Use the Opentracker interface to add properties to your users. User tagging allows you to actually add & edit the data in the Visitor Profiles for each and every visitor with a simple mouse click. This feature turns Opentracker into a very powerful CRM system – you can combine contact information with actual website browsing history.